This purr-fect umbrella is so chic, you just might find yourself looking forward to the next rainy day just to show it off. Splashy animal print keeps you covered in celebrity style! Weight 0.8 lb. Nylon fabric and metal. 1 3/4″ x 4″ x 34″ high; 41 1/2″ diameter opened. * Buyer must charge a 20% restocking fee for return item. 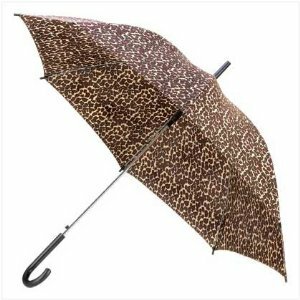 * Splashy animal print keeps you covered in celebrity style! * Weight 0.8 lb. Nylon fabric and metal. 1 3/4″ x 4″ x 34″ high; 41 1/2″ diameter opened. * Exceptional customer service and unparalleled product expertise.